Buying a Sports boat can be an exciting prospect, but don't get too carried away. You need to make some decisions first before you go and find your ideal boat. What are you going to use the boat for? Examples are fishing, water skiing, cruising etc. How often are you going to be able to use your boat - every weekend, once a month, etc. Look at the possibilities for moorings in the area where you are going to use the boat, or consider keeping it at home on a trailer. What is your budget for the purchase and for on-going costs. A sports cruiser is generally considered to be similar to a speedboat but has the room for at least one cabin. They are motor cruisers which have been designed with the sports enthusiast in mind. The price and size of these vessels can range from about £15000 for a Jeanneau Leader 515, upwards to well over £150,000. Other competitively priced boats are the Cuddy Cabins produced by the likes of Bayliner, which are smaller in size but still offer a small underdeck cabin to relax in. Some are built by the same manufacturers as the motor cruisers to complete a full range of boats. At the luxury and performance end of the market both Fairline and Sealine amongst others have a sports series in their range. Speedboats or powerboats are normally streamlined boats with very powerful engines in them. They range in size from the small Zapcats which were originally designed from surf rescue crafts in South Africa, and although they are only powered by a 50 horsepower engine they can go very fast reaching speeds of 50mph, as they are very light. They are relatively inexpensive and because they are inflatable they can be set up and packed away easily. Seadoo Sportsters are another attractively priced option at around £20000. An extensive range of speedboats from Bayliner, Fletcher, Maxum and Sessa can be found on the Bates Wharf website, with a range of affordable prices. 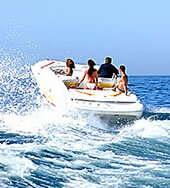 If you are looking for a high performance speedboat then the cost increases.